The killing of a second man on Saturday night has heightened tensions between Butibum villagers and settlers in surrounding areas in Lae city. The man was killed in the early hours of Saturday morning when he accompanied relatives driving a vehicle into Busulum Compound. This death comes just days after Bumbu settlers stabbed a Butibam youth last week. The victim was killed on Saturday night at the Busulum compound, he accompanied family members to the area when he got killed, and the motive of the attack isn’t known. “His nose was bleeding when I saw him, I checked his pulse and I felt no pulse, so we rushed him to the hospital,” said Nephew Willie Wayne. Butibum Villagers burnt down a store that belongs to busulum settlers. They also blocked the butibum road that connects Kamkumung to Malahang. His relatives retaliated by attacking a suspect before handing him to the police, and they had also blocked the butibum road. 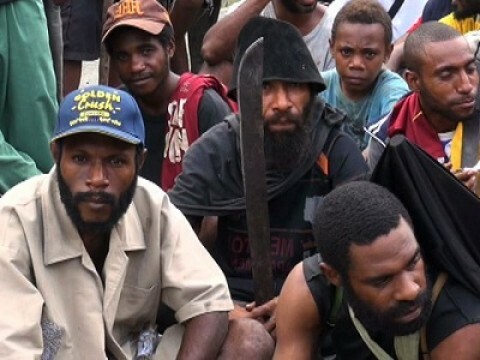 Butibum Villagers called on the Morobe Governor, Kelly Naru and Lae MP, Loujaya Toni to evict the settlers. The Lae MP and Morobe Governor both responded to the people’s concerns, they both said that the only option is to evict settlers who caused law and order problems. They would also hold the land landowners who sold their land accountable for the settlers’ actions. Governor Naru revealed to the people that a new policy is being created to regulate settlements in Lae City.